Easily one of the best premium TVs you’ll find for under $5000. WHEN you watch a movie, TV drama or documentary, Sony wants you to see exactly what the creator intended. That might sound obvious, but from the lens, to editing, to the final product what ends up on your TV can begin to look and feel rather different depending on the technology used to project it on to your screen. With its latest range of premium TVs, Sony has stepped up its mission to produce colour-accurate devices that are completely true to the director's intent. The company's "lens to living room" mantra is about leveraging its legacy in cinematography and film production (and the fact that many production houses use a Sony professional 4K OLED reference monitor, making it somewhat of a default industry standard) to make sure home viewers see exactly what the director wanted them to see. 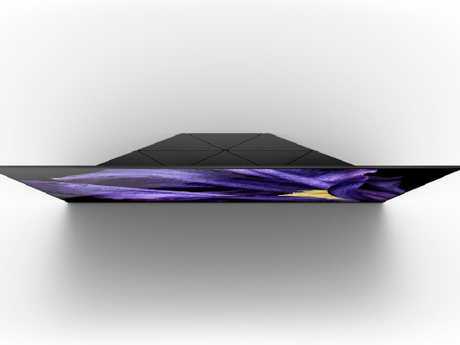 To that end, Sony showed off its new A9F OLED TVs to journalists last week, which debuted at Berlin's IFA consumer electronics fair alongside its Z9F range as part of the company's premium Master TV series. After being locked in a swanky hotel room with a 55-inch A9F for a night, it's certainly an impressive machine. It's the kind of TV that will appeal to film buffs and those who really appreciate the finer points of picture quality - and of course don't mind dropping a bit of money ($5000 to be precise) on home entertainment. The TV comes preloaded with the latest Android TV OS, Oreo. When shopping for a TV, you will be hit with so many acronyms it will make your head spin - and one of the most important is the LCD and OLED distinction. LCD TVs offer much higher screen luminance whereas OLED TVs offer precise control per pixel. Instead of having a constant light source and a panel to either allow or block it out, with an OLED display only each pixel that needs to be on will light up. As a result OLED is capable of a perfect black picture with no light emitted and offers new ways to boost contrast. 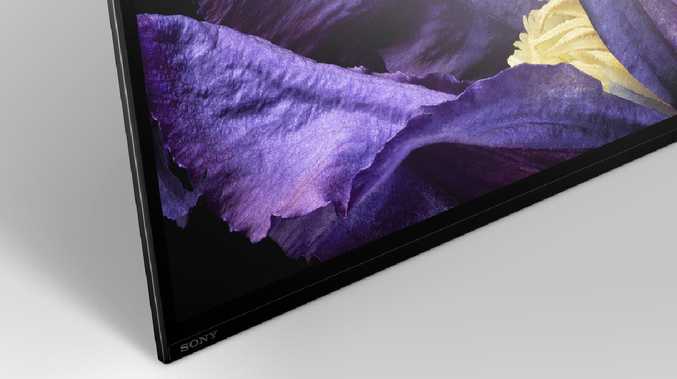 Sony's A9F TVs have 8 million self-illuminating pixels and comes with the company's new panel controller tech which it refers to as Pixel Contrast Booster. The tech claims to increase the number of colour tones the screen can deliver when showing very bright HDR (high dynamic range) content, enhancing the picture with extra detail and texture. Whatever it's doing exactly, it produces a striking and clear picture that looked really great under different conditions. 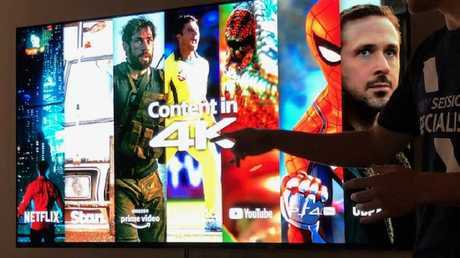 "We want to have the most colour correct TV on the market," a Sony spokesperson said. Earlier in the day, journalists were shown how the TV stacked up to rivals on the market at a similar price point. In one example, the black of the night sky blended seamlessly with the black bezel on the Sony TV making it completely disappear as a frame. But the black on the competitor's display was not a true black and clashed with the bezel. "Some of our competitors are trying to be brighter, some of our competitors are trying to be darker. We're about colour accuracy," the Sony spokesperson said. Sony has also brought out a capability that is calls X-motion clarity which improves the picture quality and detail by minimising blur during fast-moving or panning shots. The video below shows the difference on a Sony Z9F TV. The display on the left has X-Motion Clarity enabled while the TV on the right does not have the picture processing. Look at the detail in the water or on the crowded bridge to really notice the difference. If you're a Netflix nut, Sony has partnered with the popular streaming service to create an exclusive feature to its Master TVs called Netflix Calibrated Mode. While you'll have to go into Settings to turn it on, the mode involves the decoding of metadata in Netflix shows to essentially configure the TV's display to look the same as how the creator calibrated their monitors in post-production. Again, it's all about getting the end user experience "as close to what the creator wanted as possible". Netflix, Amazon Prime, Stan and YouTube are all 4K capable and HDR support covers standard HDR10, broadcast HLG and Dolby Vision. You can also adjust the picture settings to optimise for sport or games. If you’re watching regular broadcast TV, you’re better off with a cheaper device. This one is for movie buffs. The engine of the A9F (and Z9F) series is a new X1 Ultimate picture processor that's two times more powerful than the current X1 Extreme processor. The more powerful processor means it is better at analysing the incoming signal and the panel technology to produce the best picture possible and is responsible for things like noise reduction and remastering standard definition to high dynamic range. The X1 Ultimate chip has smarter upscaling technology that can turn a SD (standard definition) feed into a picture as close to 4K as possible. According to Sony, the Object-based HDR remaster has been updated and now allows each object to be remastered individually for better depth, accurate texture and a more realistic picture overall. As for the physical aesthetics of the TV, it looks quite similar to its predecessors. It has a sleek design with a thin black bezel with a notable absence of buttons or a distracting logo. 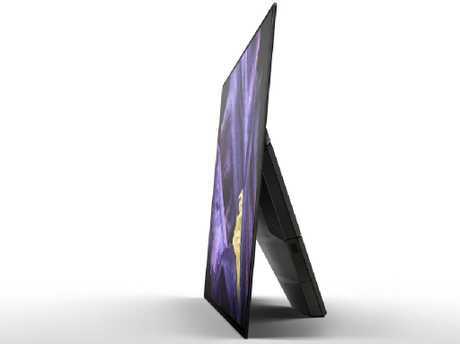 Unless you decide to wall-mount it, it has a lean-back design because Sony thinks most peoples' TV tabletops sit quite low so the lean means the screen is tilted slightly upwards. From the front, you can't see the stand which doubles as the TV's powerful speaker system. There are four HDMI inputs, all of which support 4K. The TV also comes with an AV minijack input, digital optical audio output, LAN ethernet port and two USB ports. A side view of the 65-inch A9F Sony OLED TV. One of the most interesting features is Sony's vibrating sound tech, Acoustic Surface Audio+ which is an upgrade from the design that it debuted last year. The technology uses the OLED screen itself to pump out sound, turning the screen into a centre speaker. A pair of actuators at the rear of the TV vibrate to produce sound through the screen. Couple with the subwoofers and speaker system in the rear stand, the overall sound is fantastic and device does a standout job to produce cinema-style experience on its own. But while the built-in TV audio is impressive, if you're gonna drop $5K on a TV, you're probably keen to add on an external speaker system. The good news if you do, the TV can push Dolby Atmos through to external speakers using HDMI eARC. The TV comes preloaded with the latest Android TV OS, Oreo, which certainly offers the best user experience yet. The interface is clean and easy to use and offers genuine customisation, allowing you to move around the order and position of apps and recommended content. It has hands-free voice search so you can find what you want quickly, simply by talking to the TV via built-in microphones. You can use Google Assistant to launch Netflix and Google-related apps like YouTube and Google Calendar. You can also use it to control TV settings like the HDMI source and volume. While your voice is supposed to cut through even when the TV volume is high, it did however have troubles hearing me when the TV was turned up full blast. So if you're going to do that, it's a good idea to keep the remote nearby. 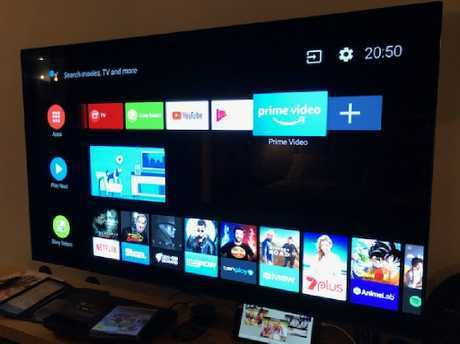 With the growing proliferation of smart appliances, TV manufacturers are keen to put the telly at the centre of our connected homes. As you would expect, you can control all sorts of smart devices through the latest Sony TVs. For example you can tell it to dim the lights, see who is at the front door if you have a smart camera connected, or even tell it to start the vacuum cleaner. The TV also has built-in Chromecast which will be particularly handy for some users. Starting at $4998 for the 55-inch version and about $6490 for the 65-inch version, it's not cheap. You can find TVs that boast 4K UHD for a fraction of the cost. So if you typically watch regular broadcast TV and non-4K content, you're much better off buying one of them. But if you're a stickler for picture quality and detail, and love the movies, it's one of the best premium TVs you'll find for under $5000. It’s an attractive looking TV but not everyone will like the lean-back design.